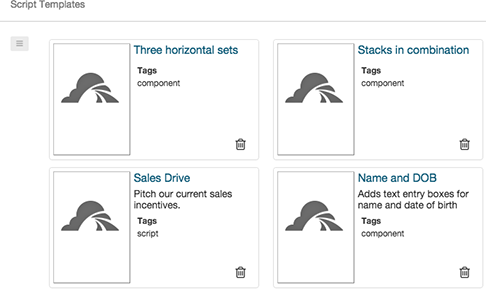 Thumbnails on the Templates page represent component and script templates. Script templates are entire scripts that are packaged for reuse. Use a script template when you create a new script. Component templates contain one or more visual components (text boxes, images, buttons, and so on) that you can insert into a script page. This view lists templates of both types so that you can delete templates that you no longer need.